The Destination Project is the place where undergraduate and graduate students can begin their careers in the sciences, where they will take their ideas and, with the help of faculty researchers, entrepreneurs and industry mentors, turn them into productive businesses. It’s the place the next generation of researchers, scientists and scholars will credit for the start of their science careers. 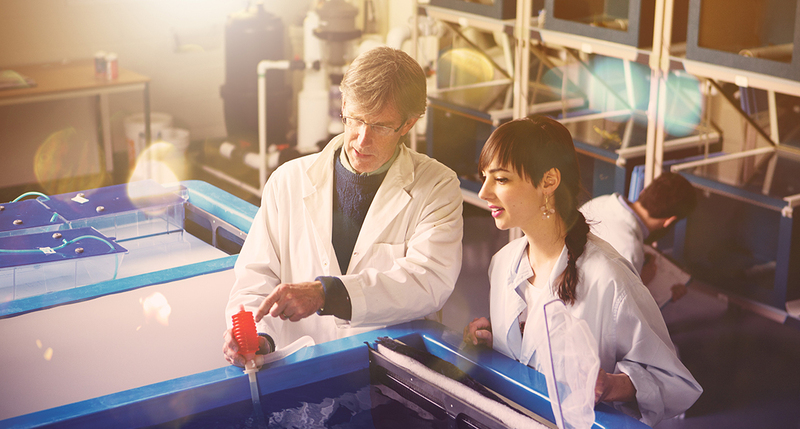 For many faculty members, it’s about supporting the excellence that already exists. “The interaction of students with researchers at every level is essential. The building must reflect this; it is the strength of the program at the University of Lethbridge,” says chemistry and biochemistry professor Dr. René Boeré, who’s been integral to the visioning process. This is echoed by Dr. HJ Wieden, an Alberta Innovates Technology Futures Research Chair and the faculty advisor for the U of L’s International Genetically Engineered Machine (iGEM) team. “iGEM enables students to get their first taste of research,” says Wieden of the U of L team, which regularly ranks among the top teams worldwide. Supported by innovative new programs like the recently launched AGILITY, which nurtures and supports innovation and entrepreneurship, the Destination Project will provide more opportunities for students to develop skills they can use either in industry or academia down the road. The interaction of students with researchers at every level is essential. The building must reflect this; it is the strength of the program at the University of Lethbridge.